In a new exclusive video for Entertainment Weekly, Miranda assesses the similarities between his DuckTales character, Gizmoduck, and Alexander Hamilton. Also, in gallery there’s another photo promo. 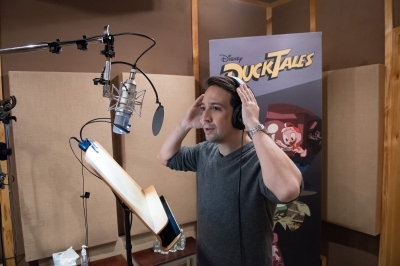 What’s more, Entertainment Weekly talked with the DuckTales reboot creators Francisco Angones and Matt Youngberg about Lin-Manuel and his involvement in the show. You can read the interview under the cut. ENTERTAINMENT WEEKLY: How did Lin-Manuel Miranda get involved with the show and why did you guys feel he was a good fit for the role? MATT YOUNGBERG: He’s a super fan just like we are. You mentioned there’s not a lot of Latinx superheroes, but in the days of classic Disney animation, representation was also either lacking or offensive — was that something you were looking to combat? YOUNGBERG: Yes, definitely. Something that is very important to us on DuckTales is diversity. You’re talking about a show that is primarily about these rich, white ducks. How do we make sure that we’re trying to be representative of the world as a whole, even though we’re dealing in this realm of ducks and animals and pigs and all of these different kinds of animals living in this world? How do we bring in representation? Part of that is who we cast. Casting was very important to us, as we cast to bring in representation of different cultures. Also as we go around the world and we meet other characters, regardless of what kind of animal it is, it was important to us to bring in actors who were representative of that culture. So if we’re going to Egypt, it was important that we find an Egyptian actor to portray the main villain or hero depending on what kind of character the new character’s going to be. Lin represented a really great opportunity for us to bring some more multi-culturalism into this weird show about these white ducks. ANGONES: But also in a way that doesn’t call him out. Because he’s such a part of the core of what the original DuckTales was – it’s not that he is the Latino superhero or the Latino cast member, he just happens to have Latino roots, and he’s so much more built in this realm of being a young, scrappy, and hungry scientist intern. He has so much more going on. This adds an extra layer to that without seeming like we’re doing it for the sake of doing it. YOUNGBERG: We’re not trying to hang a lantern on it or anything. We’re just trying to represent the world to kids in the way that they see the world. Kids today have a much broader, multi-cultural view of the world to the point where it’s just the world. It’s not specifically you’re calling out “oh, he’s Latino.” It’s just “He’s Latino,” that’s all it is. That’s just his background and that’s who he is. ANGONES: That’s something in subsequent Gizmoduck episodes that we explore, like his home life and his family and how that works without ever being very on the nose about it. Will the show make use of Miranda’s rapping or musical talents at any point? YOUNGBERG: One of the funny things about Fenton Crackshell-Cabrera as a character is, he talks a mile a minute. 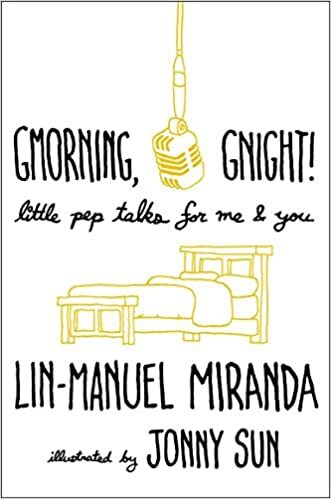 Lin obviously talks a mile a minute, but the issue with Lin is, he’s so good at talking so fast and having people understand every single word that when you’re listening to him talk it doesn’t sound that fast. So we had to actually try to make Lin worse in talking than he is in rapping. So it sounds like he’s jumbling and fumbling all over himself because he’s this kind of absent-minded character. Lin’s too competent is the problem, he’s just too good at everything. It would be a little weird for our nerdiest character to all of a sudden be a hip-hop savant. Lin was a big fan of the original series – did he have any sort of input on his character because of that and the direction he would take? YOUNGBERG: It seems he’s very happy coming in and doing what we write because this is a very exciting thing for him. The fun thing about Lin is, he’s really down for anything. We’ve thrown some really funny curveballs at him through the duration of the series, and he’s always game for it and bringing such interesting takes on things that we would have never expected from him. ANGONES: Especially versions of characters that he never gets asked to play. There’s a baseline Lin to Fenton Crackshell, but then some of the directions we go in this and subsequent seasons, he’s like, “Wow I’ve never done that before.” No one’s asking Lin-Manuel Miranda to be in a Marvel movie. We have a lot of room for playing with the actors on our show because we have such a stacked cast of very funny people, but he did improvise my favorite line in the entire episode, when he’s rooting for Launchpad to win this race, he’s yelling out, “Go, you bumblebee-like savant, go!” It’s perfect. At that point, he really got it. But he also watches the show with his kids which is really nice. He’ll message us when he watches an episode. He’s been super supportive and a joy to work with. What can we expect from his character going forward? YOUNGBERG: The most fun thing is, in this world of crazy adventures, Gizmoduck becomes the de facto superhero. You have Scrooge being like Indiana Jones and going out on these amazing adventures, but when you have Gizmoduck show up, you’re going to have more of a superhero-themed type episode. We have a lot of fun with that aspect of his character. But also, we really have a lot of fun digging into his personal life and who Fenton is outside of when he’s being Gizmoduck. In fact, I think that’s what makes Gizmoduck more interesting is that we spend a lot of time getting to know Fenton. ANGONES: He’s not meant to be a superhero at all. He’s a scientist. We originally pitched him as half Peter Parker, half Iron Man where he’s just kind of figuring out, “Is this a thing I should be doing? I’m very much more at home and comfortable in the lab, and now I have a million gizmos that can pop out of my chest at any moment and what do I do with that?” So it is a lot of fun super-heroics. We always say that Scrooge is the person who makes sure Duckberg, when it’s in the eye of the hurricane, stays standing, but when he’s adventuring someone else has to protect it and it might as well be Gizmoduck.